The ideal kit to have for those oops moments! We use our phones all the time, and we rarely go anywhere without them. We bring them with us when we are driving, at work, eating etc. The one major threat to the smartphone is that it can get wet. Many homemade solutions such as a hair drier, microwave, or putting the wet phone in a bag of rice have proven to be unreliable. Yet do not despair! 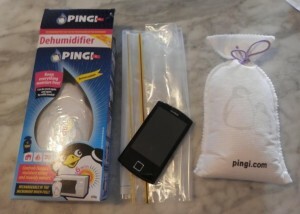 Our unique PINGI Wet Phone Sydney Restoration Kit may help save you and your friends hundreds of dollars in preventing wet phone damage. When a smartphone gets wet, it is crucial that the wet phone is switched off immediately to prevent damage to the circuit board. Remove the battery and sim card of the wet phone. Dry with a towel. Also dry the external parts of the phone, including the screen. Place the individual parts of the phone in the snap-lock bag together with a PINGI XL moisture absorber. Make sure that you remove the packaging around the PINGI XL bag to enable the silica gel pellets to absorb the moisture of the wet phone. Let the components dry uninterrupted for three days. Then put the phone together again. Although there are no guarantees of perfect restoration once electronics are exposed to water, the PINGI Wet Phone Sydney Restoration Kit will give your smartphone the very best chance of functioning again. REMEMBER: The PINGI XL 450g moisture absorber is rechargeable in a microwave oven, which means that your PINGI Wet Phone Sydney Restoration Kit can be used many times. PINGI moisture absorbers are also great for keeping mouldy cupboards and wardrobes dry. See our Home Page for more tips on where you can use PINGIs. For further information on this subject, you can also visitCNET. Wet Phone Sydney Restoration Kit today!